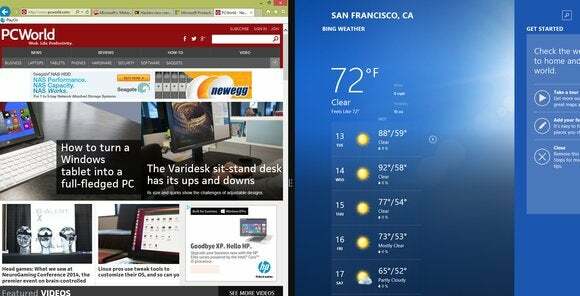 Imagine being able to swap between two different app windows on the same screen. Crazy, huh? On a Windows PC or tablet, of course not. Ditto for large Samsung Android phones, phablets, and tablets. But on the Apple iPad and Windows phones, swiping back and forth between apps has not been part of the way users work. Until now, that is. If a report by 9to5mac is to believed, the next version of iOS, or iOS 8, will include the ability to run two application windows on the same screen. Users will be able to copy data from one app to the other, and Apple will even let users “snap” the windows to maximize the available screen space used by either app. This functionality may mean that Apple is finally ready to enable “XPC” support in iOS, 9to5mac noted, which means that developers could design App Store apps that could share content. Could snapped apps be coming to the iPad? Of course, this comes with the normal caveats: this may not be true, or it may debut in some sort of limited capability—restricted to Apple’s own apps, for example. But if Apple does roll this feature out, it will be inevitably be seen as an acknowledgement that Microsoft’s Surface tablets were on to something. Windows RT and its small coterie of compatible apps may be one of the platform’s embarrassments, but the ability to snap an app or two quickly to one side of the screen and keep working has always been seen as one of the Surface’s most distinctive features. Apple’s Worldwide Developer Conference takes place beginning June 2 in San Francisco. The company is expected to debut iOS 8 and perhaps some new iPads to go along with it. For those stories and more, please visit our sister site, Macworld.